Justin Bieber teamed up with Vietnamese electronics company TOSY to help it unveil its latest product, called mRobo Ultra Bass, at CES 2012. Justin Bieber drew a huge crowd, and despite some technical difficulties, the 17-year-old successfully showed off the mRobo, a portable speaker that transforms into a robot and can dance to the beat of your music. The mRobo tips the scales at 3.3 lbs, and will not be taller than 18″ in size. 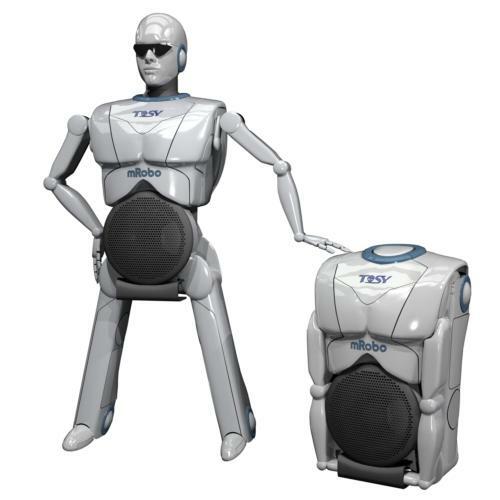 According to Slash Gear, the mRobo can store 2GB of music or around 500 songs, but the dance moves are pre-programmed and operated by remote. The robot speaker will be available for purchase for $199 this fall.